When discussing ultimate spiritual topics, it is necessary to keep in mind at all times that words and concepts do not suffice. Any attempt we make to describe the transcendental is ultimately futile, for the boundless cannot be encapsulated within a concept, a word, a name, or a form. Nevertheless, it cannot be denied that human beings from time immemorial have attempted to wrap their minds around and to articulate the nature of some "thing" beyond their human natures-some "thing" that transcends the psycho-physical entity which they regard as "themselves". This vain striving to capture the "truth", to make the infinite finite, is a reflection of our spiritual nature. Indeed, we can label this quest for ultimate knowledge as "science", or we can call it "religion", but regardless of what we call it, it is spiritual. Some may argue that it is not a spiritual quality, but rather an intellectual quality of humanity that compels one to verbally describe ultimate principles. This is a typical Western philosophical stance, since it is common for the Westerner to equate the "soul", or transcendental entity or principle, with the "mind". (It is of interest to note that the word "Psychology", which has been defined in the West as the "Study of Mind", literally means "Study of the Soul"; this indicates that the mind and soul are perceived as one in the same in the West.) The Indian Vedantin, however, with razor-sharp intellect, vehemently denies that the mind is the transcendental principle; for him, the mind is but a gross entity emanating from and controlled by subtler and subtler entities-the most subtle of all being the Atman, the TRUE SELF, the WITNESS (Sakshi). According to the Advaitist Vedantin, the true spiritual aspirant must eventually become intimately familiar with the workings of his "inner equipment". He must first hear of it, then rigorously contemplate upon it, and then, through meditation, use the equipment to overcome the equipment. 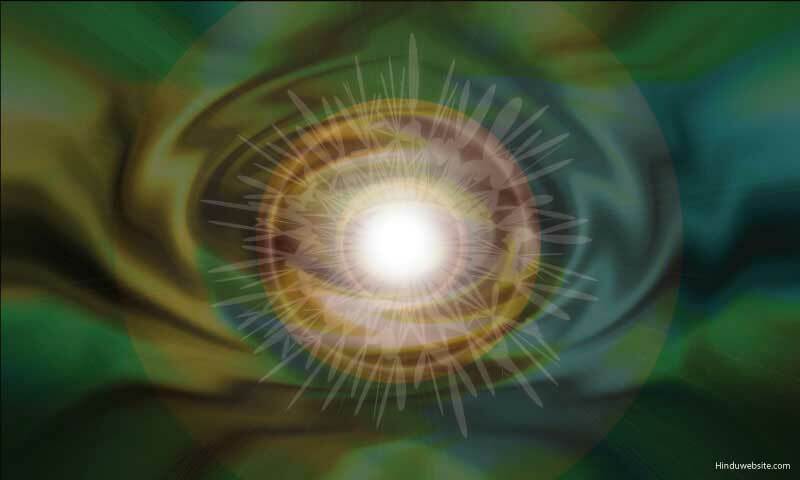 This is the science of Vrtti Jnana, or "Ripple (Emanation) Knowledge". To understand this science, one must first understand that the Atman is regarded as Absolute; it is timeless, spaceless, causeless, changeless, and infinite; it is the Sakshi, or "Witness". It is Pure Consciousness. It is the substratum for all phenomenal motion and action, whether physical or psychological. The phenomenal motions and actions themselves are referred to as "vrttis", or "ripples". All of these ripples emanate from the Sakshi, the most subtle of all subtleties. The Antahkarana is likened to a ray that consists of four aspects, which emerge when the Sakshi (Atman) expresses: 1) Ahamkara (the ego), 2) Chitta (roughly translated as the "subconscious"), 3) Buddhi (the intellect), and 4) Manas (the mind). It is more useful to think of these aspects in terms of their functions than in terms of distinct entities, for in truth, there is no independent substance to any of them. They arise together and coexist in the phenomenal internal world, so to speak. Nevertheless, for the sake of communication, we will speak of them as if they are independent and arise sequentially. The ahamkara is the first aspect of the Antahkarana to emerge when the Sakshi (Atman) expresses. It is the subtle "limited I-consciousness" and functions in two ways: 1) by Avarana, it veils the Sakshi from which it has emerged, and 2) by Vikshepa, it projects as something different from itself, expressing as cause (karana) and effect (karya), or subject and object. Because of the ahamkara, during waking consciousness (jagrati-sthata), we identify ourselves with our limited body and minds and perceive a phenomenal universe of multiplicity. During deep sleep (sushupti), vikshepa ceases, but the avarana persists. The karya (effect) withdraws back into the karana (cause), the object back into the subject. The ultimate "goal" of the practitioner is to get behind this deceitful ahamkara and merge with the Sakshi, the Real Self, the Real "I". The Chitta is less subtle than the Ahamkara and is responsible for remembering and forgetting. The forgetting process is called "Apohana", and the process of recollection is called "Smrti". The Chitta receives knowledge from the Buddhi (to be discussed next) and stores it. The process of forgetting (apohana) is actually the taking of knowledge from the front of consciousness and placing it in the background. Remembrance (smrti) occurs when the information is taken from the background and given back to the forefront. The Buddhi is less subtle than either the Chitta or Ahamkara and is responsible for making decisions and directing the Manas, the grossest aspect of the Antahkarana. In short, the Manas works in conjunction with the five sense organs (jnanendriya)-the eyes, ears, nose, skin, and tongue-and serves as a plate upon which the impressions gathered by the jnanendriya are imprinted. The Manas goes forth, as it were, collects the impressions from the jnanendriya, sorts, and changes them into concepts. The Manas then hands these concepts over to the Buddhi, which subsequently rejects most of them. The concepts that the Buddhi keeps comprise our knowledge. As already mentioned, the Buddhi then, through the process of apohana, puts the knowledge into the background of consciousness. The Antahkarana can operate in two modes: 1) by the process of abhijna, it can look outside and obtain external knowledge. This process involves the gross coming out of the subtle, such as described above, where the Manas evolves from the Ahamkara. 2) by the process of pratyabhijna, it can turn inward and obtain Self knowledge. This process involves the gross going back to the subtle, where the Manas involves to the Ahamkara and ultimately to the Sakshi, the Atman. As pointed out above, the purpose of Vrtti Jnana is to realize the Sakshi (i.e. merge with the Witness), and this realization demands Mano Nasa, the killing of the mind. (Here, the "mind" aspect is synonymous with the Antahkarana gestalt.) However, the process of killing that mind requires the concentrated use of that very mind-that is, the mind kills itself. When that is accomplished, Pure Consciousness alone exists, beyond all of the concepts, ripples, Vrttis just described. The method is to merge all objects (the gross vrtiis) back into the absolute subject, the Witness-that is, Pure Consciousness. To do this, one must first make use of the Buddhi Vrtti to fully digest and assimilate the material expounded here. She must then make use of the Chitta Vrtti to REMEMBER. Once the Sakshi is located, all Vrttis dissolve into it. With that, comes the experience of "Neti Neti"…"Not this, Not this".